What a cute kitty! You get a little bit of every color cat you could wish for all in one with Snickers! Snickers is a 7-month-old female kitten who was found as a stray and brought to Lollypop Farm. She has had a tough time during her short life, and she hopes that she finds a loving home soon! Snickers is a sweet, cuddly girl who is living with cats, dogs, and children during her stay in foster care. In fact, she especially loves the Pomeranian! 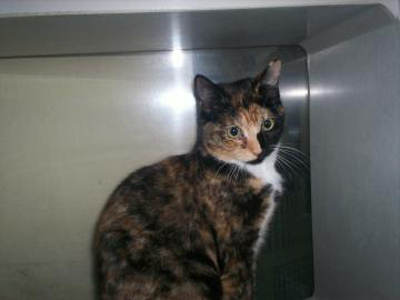 Snickers is currently in foster care, so if you'd like to meet her, contact foster mom Sue at 225-7716.